Can you guys please find a way to show at the top of all pages who is in chat? It is now a guessing game and people dont go in because they dont know if anyone is going to be in there. Before you guys took over, we had it set where it was visible to everyone signed in or not, and it helped prompt others to pop in. Manafel, Summer and vreugy like this. I have sent a request asking if we can add something like this. Awesome. I hope its possible. That helped guide newbs to the chat to ask stuff, which in turn got them active on the forum because quite frankly we are awesome. It is possible. It is the same program, just with a different skin. The designer just has to do it. Shouldnt be too hard if Jared had it set up like that. Chat and the forum are different so we'll have to see if the chat program has something that we can add to the forum, since the program is run by a third party, if they don't have this function then we can't do it. I hope you guys understand that. Sure do. However the chat system has been the very same from 2009 If I recall, maybe even before. i am sure that if it was there before it still is. Sorry guys, I think I might have missed this over the weekend. The office wasn't open. But I think I'm not getting the picture. Can't you see who's online in chat over here on the left bar? 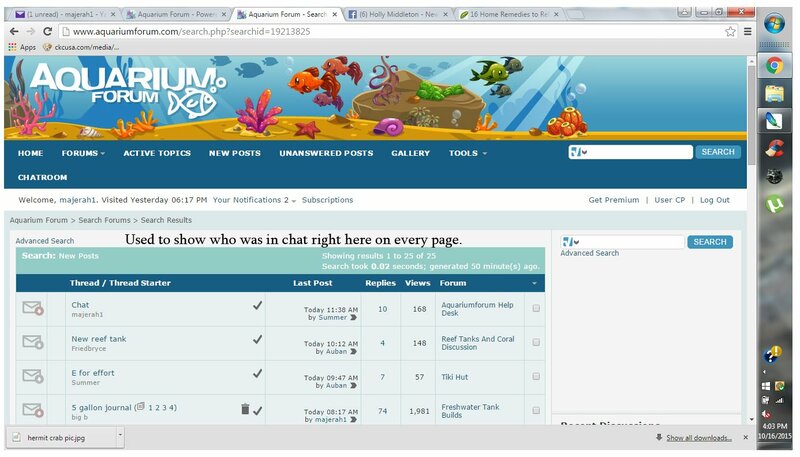 Or did you want to know who is in chat before you log in? PM? like private message? or chat messaging? I can't find it in classic mode. There used to be a separate *box*, like the boxes under "What's Going On", which one box lists the individual users currently on the site. The difference being, this box would list Individuals currently in *chat*. This allowed individuals NOT in chat, to see who is in chat. Most users ever online was 2,753, 01-04-2014 at 10:55 AM. Private message, it wont let me respond back to you. But anyway it was a box like wes is explaining and it said something like "Users currently in flashchat: list list list list" SO if I logged on and saw that bev was in chat I'd pop in, if I didnt or no one was there I wouldnt. Those links I sent you explained how to install this add on to vbulliton. Click the pic. This is what we are talking about. @[email protected] this is something beyond me. I'll send this in to see if the techs can do this. Thanks for getting me all this information.